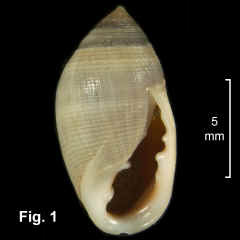 Description: Shell with aperture about 60% of total shell length. Spire elevated, convex in outline, whorls weakly convex. 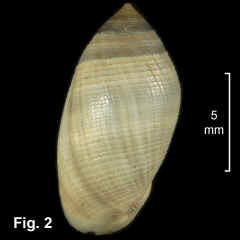 Shell with numerous spiral grooves over whole surface. Aperture fairly broad, with 2 folds at bottom of inner lip, and smaller fold at top. Outer lip with 4 denticles internally, the middle 2 stronger, and callus extending below as thickening inside lip. Outer lip with very low, wide callus externally. Umbilicus closed by reflected columellar callus. Colour brown or grey - almost blue-grey - with faint white spiral bands at top of whorls. Distribution: In Australia, this species is known from Roebuck Bay, south of Broome, WA, across northern Australia, and southwards to Brunswick River, NSW. The distribution outside Australia is unknown. Habitat: In mangroves, on mud. Figs. 1, 2: Gladstone, Qld. (C.410589).